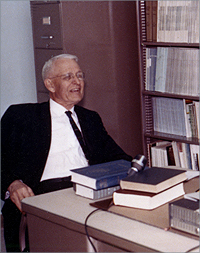 Harvey Fletcher was Emeritus Professor of Physics at Brigham Young University (1952-1981). Other institutional affiliations included Columbia University and Bell Laboratories. His research interests included acoustics and atomic physics. September 11, 1884Birth, Provo (Utah). 1907Obtained BS, Brigham Young University, Provo (Utah). 1911Obtained PhD in Physics, University of Chicago, Chicago (Ill.). 1911 – 1916Professor of Physics (1911-1916) and Head, Department of Physics (1911-1916), Brigham Young University, Provo (Utah). 1916 – 1928Engineer to Acoustics Researcher, Research Laboratories, Western Electric Company, New York (N.Y.). 1928 – 1949Director of Acoustical Research (1928-1933) and Director of Physical Research (1933-1949), Bell Telephone Laboratories, Murray Hill (N.J.). 1929 – 1931President, Acoustical Society of America. 1935Member, National Academy of Sciences. 1940 – 1942Chair, Section 5 (Sound Sources), Division C, National Defense Research Committee. 1949 – 1952Professor of Electrical Engineering, Columbia University. 1952 – 1981Director of Research (1952-1974); Dean, College of Physics and Engineering Sciences (1954-1957); and Emeritus Professor of Physics (1974-1981), Brigham Young University, Provo (Utah). July 23, 1981Death, Provo (Utah). Ph.D. advisor at University of Chicago and worked together on oil drop experiment. Director of Acoustical Research and Director of Physical Research. Obtained BS (1907). Professor of Physics; Head, Department of Physics; Director of Research; and Emeritus Professor of Physics. Chair, Section 5 (Sound Sources), Division C.
Engineer to Acoustics Researcher, Research Laboratories. Obtained PhD in Physics (1911). A talk with Harvey Fletcher [motion picture] / produced by Bell Telephone Laboratories. Collection on Harvey Fletcher, 1947-1955. Harold B. Lee Library. Special Collections Division. Harvey Fletcher autobiographical notes, 1956. Harvey Fletcher correspondence on the naming of the Eyring Science Center, 1954. Invited papers on physics today [sound recording], 1951 October. Modern theory of hearing [sound recording] / 1964 May 15. Oral history interview with Harvey Fletcher, 1964 May 15. Oral history interview with Harvey Fletcher, 1979 May 9. Carl F. Eyring class notes, 1912-1913. Oral history interview with Frederick Vinton Hunt, 1964 December 18 and 1965 January 8. Oral history interview with Homer Edward Newell, 1980 July 17 and October 20. Oral history interview with Jozef Zwislocki, 2008 December 8. Oral history interview with Leo Beranek, 2009 August 10. Oral history interview with Vern Oliver Knudsen, 1964 May 18. Oral history interview with Vern Oliver Knudsen, 1966 December 20 to 1969 June 3. Teacher, researcher, and administrator: transcript. Harvey Fletcher Physics Today obituary.